Who is behind Matthew Labs? and I'm founder and developer of Matthew Labs. Founded in September 2010, Matthew Labs is run from a little town in the South of Italy and its goal is to develop and deliver beautiful applications for your iOS devices and useful open source codes. We try to make our applications as simple and useful as possible so the user will soon understand how they work and what is their purpose. We also want to be always updated since we work to improve our products and are glad to listen and receive requests and suggestions about them. In fact, you can contact us by email or through our social networks below. 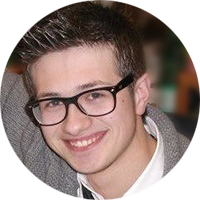 As we said before, Matteo Del Vecchio is the person behind Matthew Labs. I'm currently a student in Informatics because is one of my biggest hobbies. I hope my job will be about that area and will let me travel a lot... Even though I'm Italian, I really love everything that is English but, most of all, USA and UK! I usually talk with other developers across the globe so we can exchange ideas and thoughts and I even have to thank some of them because they helped me to become the developer I am now. I'm really glad to be part of this amazing community!